Looked at the picture before reading your comment and thought you did that on purpose. 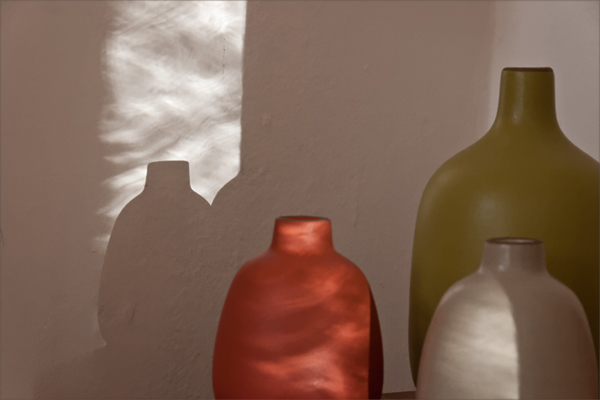 Pretty vases are everywhere, but what did you do to the window to get those sweeping brushstrokes of light? And a modern pinhole camera? Interesting…. It’s a portly family at a movie! It’s a gathering of differently-crednetialed speakers at a PowerPoint meeting. It’s anthro-po-morphic April at her finest cinematically. Oh yeah, the colors splashing across the curvilinear surfaces are magical! What delightful stories you envision for this image, Ted! Me and my husband laughed on reading, because they’re so apt.